Newly built, with special attention paid to detail and character, this unique cottage combines centrally heated modern comfort and convenience with a traditional feel befitting it's location. On entering the cottage you will find the master bedroom with a king size bed and patio door opening onto the sun trap decking in the rear garden. 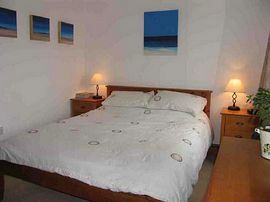 The 2nd bedroom has two full size single beds and a walk in wardrobe. The bathroom is fitted to a high standard with a spacious shower bath. There is a large boot room, perfect for all your outdoor gear. 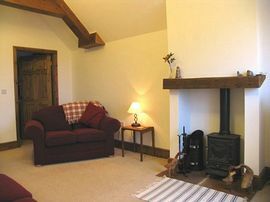 Upstairs the large lounge has a vaulted ceiling with exposed beams and magnificent views across Beadnell Bay to Dunstanburgh castle. The log burning stove creates a cosy atmosphere on chilly evenings, while the range of DVDs, CDs, books and children's toys will ensure everyone is entertained. The lounge leads to the dining area with a table to seat six comfortably. Also off the lounge is the well-equipped farmhouse style kitchen with dishwasher, washer/drier, combi microwave and fridge freezer. High chair, travel cot, steriliser available on request. 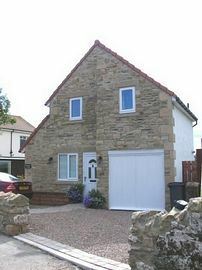 Outside you have a fully enclosed south facing rear garden. The hardwood garden furniture and barbecue mean you can relax outdoors well into the evening. To the front there is parking for 2 cars. Fantastic coastal views from 1st floor lounge. Safe short walk to beach. 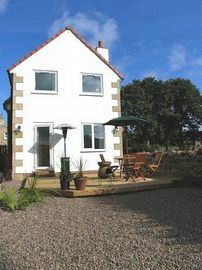 Local Services: Great location for exploring the northumberland coast by bike or on foot. Golf and sports facilities nearby. As the A1 becomes dual carriageway after Alnwick, keep an eye out for a turn on the right, sign posted 'Preston Tower' and Chathill. Take this turn across the central reservation. Take the first left hand turn as the road becomes dual carriageway, 4 miles after the Q8 service station at Adderstone Services. Sign posted 'Preston Tower'. Follow the road for 3 miles or so, passing Preston Tower on your right at the top of the hill, until you reach a T junction. Turn left at the junction towards Seahouses and Beadnell. Follow this road for another 3 or 4 miles (over the railway crossing at Chathill, and through the staggered crossroads at Swinhoe). After the hamlet of Swinhoe, you will see the sea straight ahead and the village of Beadnell below you on the right. Take the second turn for Beadnell, which is opposite the graveyard. This road brings you into the village with the Craster arms pub on your left. Take the first road on your right, passing the Beadnell Towers Hotel on your left. At the T junction, turn left onto Meadow Lane. From: £210.00 to £595.00 depending on season. "well equipped & friendly - a home from home" "We will definately be coming back" "wonderful view from the living room" "presented to a high standard with many thoughtful touches" "cottage was everything we had hoped for" "The toybox was fantastic as were the books and dvds"